I think its worth commending DCB on bringing about the change. Most saw the benefit but even more so now that draw has put names on the groups and match ups. While it was obvious a change was needed, that doesn’t always lend itself in the GAA to change happening. They also stuck to their guns re:appeal. Anyone know what happens to 3rd & 4th place finishes? 3rd place are done after the three group games. 4th place teams go into the relegation play-off. Wondering how Plunketts and Raheny ended up in the same group. Seeded 9 and 10 so should be no way they are in the same group. Only top 4 were seeded for draw I think. rest were seeded just to be in top 16. Fair play to the board is right. Who would be favourites to come through with Jude’s from their group ? Slys were very poor last time I saw them , Vins beat them well in champo last year . Is that confirmed? And for hurling also? When are dates and venues out for championship? Dates and venues are up on hill16 (you have to do a fixtures search around the date blocks from the planner to find them (14/15 April 28/29 April), not linked to the “Competitions” page yet. Due to my current location I can’t access the odds with Irish betting companies. 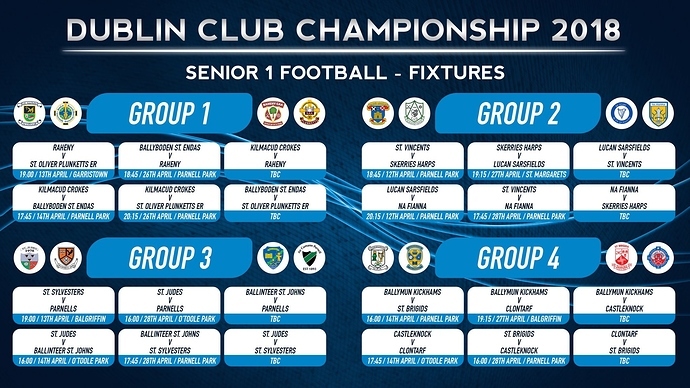 Is there odds for the senior football championship up yet? Boylesports have Na Fianna at 14/1 but they also have 32 teams listed, Ladbrokes have them at 15/2 (16 team competition).